To make things more interesting, I decided to also make my own burgers. You could just as easily buy patties at the supermarket. This recipe makes four melts. In a bowl, mix the beaten egg, the ground beef, and the minced garlic. Add salt and pepper to taste. Some people believe that it’s better to add the salt and pepper when the burger is cooking, so that’s okay too. I mix it with my hands to really get everything incorporated. 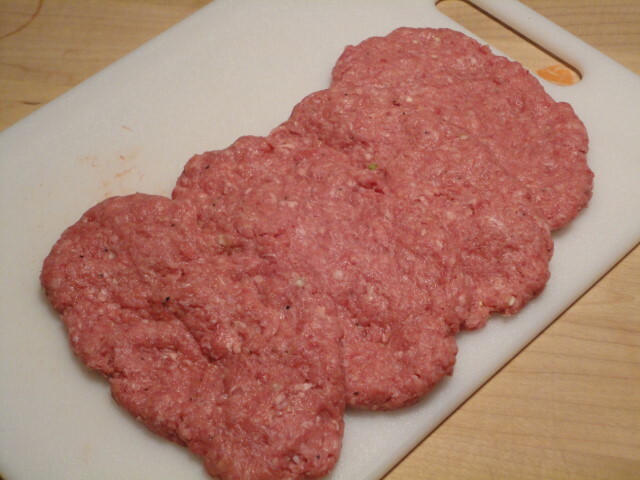 Split the mixture into four equal parts and flatten them into burger patties. 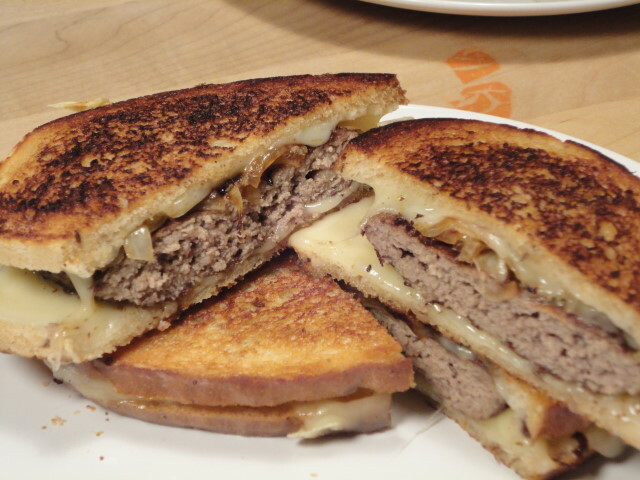 For this recipe, I made them oblong, and flatter than the usual burger in order to fit nicely on the bread. 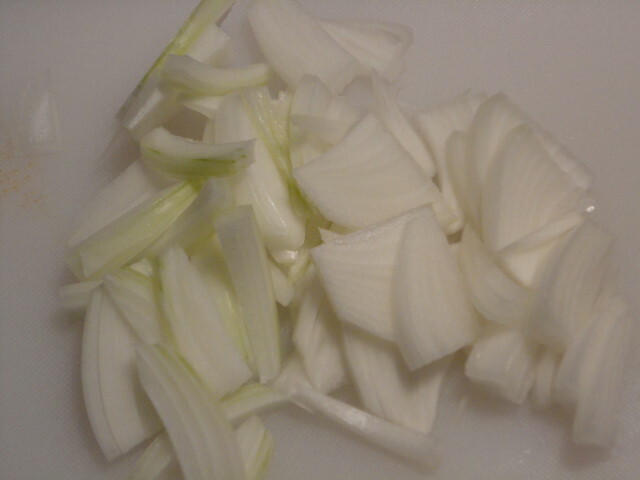 For sautéed onions, chop the onion into wedges. Put some oil in a pan and saute those onions on medium heat until they start to caramelize. They’ll start getting brown as the sugar in them cooks. I managed to miss taking a photo of them, but hopefully you get the idea. Remove the onions from the pan and set them aside. 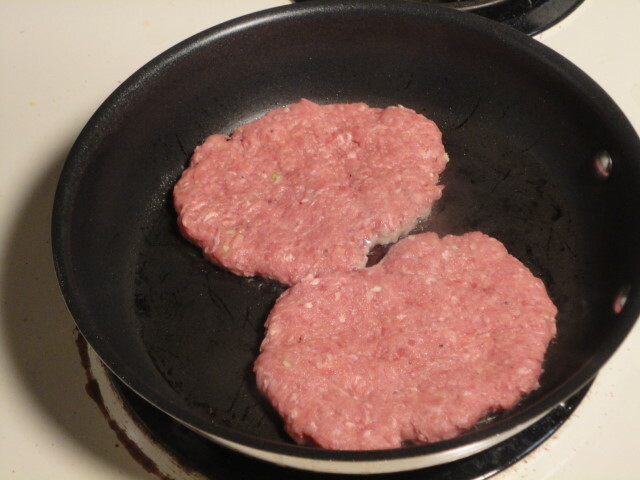 Turn your heat up to medium-high and place two burgers into the pan. Let the burgers cook for two to three minutes on the first side, then flip them. How long you let them cook depends on how you like your burgers done. I usually cook mine medium rare, but this time I went medium well. After the first burgers are cooked, do the same for the other two. Set these aside on a plate. 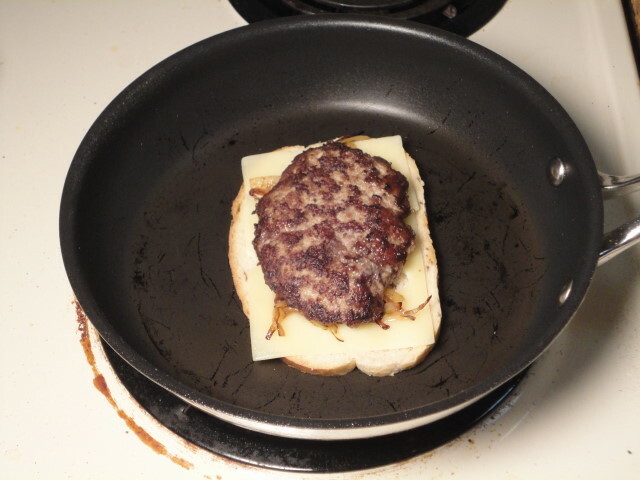 While the burgers are cooking, butter the slices of bread on one side. My butter was partially melted, so the picture might look a little weird. Now that the components are all ready, it’s time to build the melts. Place a pan (a clean one) over medium heat. 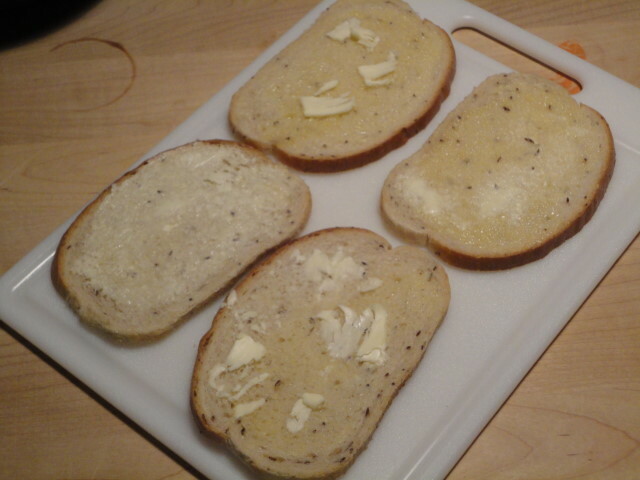 Place one slice of rye bread in the pan, butter-side down. 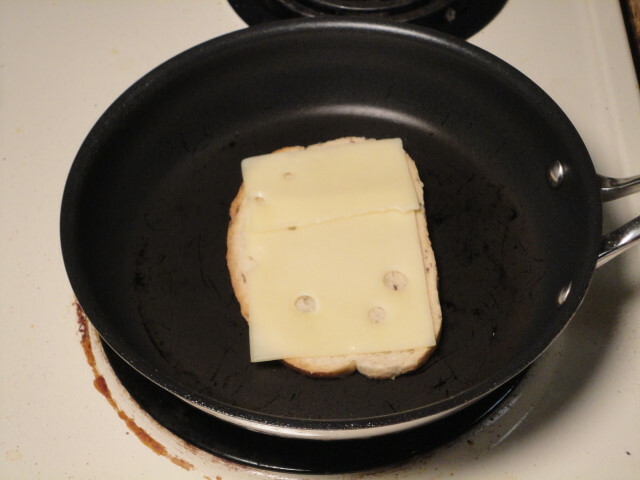 Add a slice of cheese. Next, spoon some sautéed onions onto the cheese. Place the burger ever-so-gently on top of the onions. 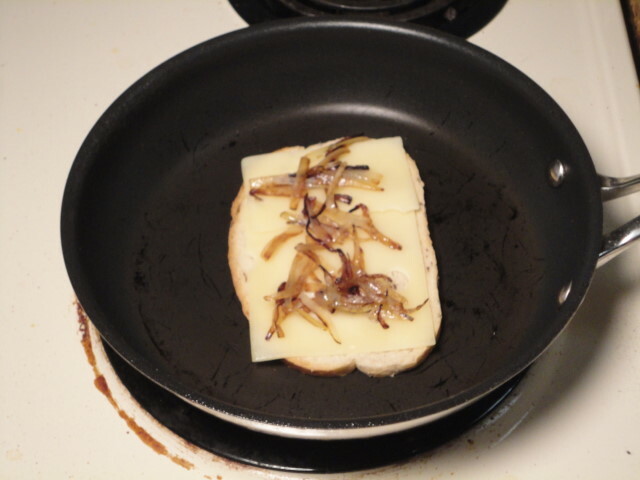 Move the melt over, and place another slice of bread and a slice of cheese in the pan, butter-side down. It won’t be long until the cheese starts melting and the bread is toasted. 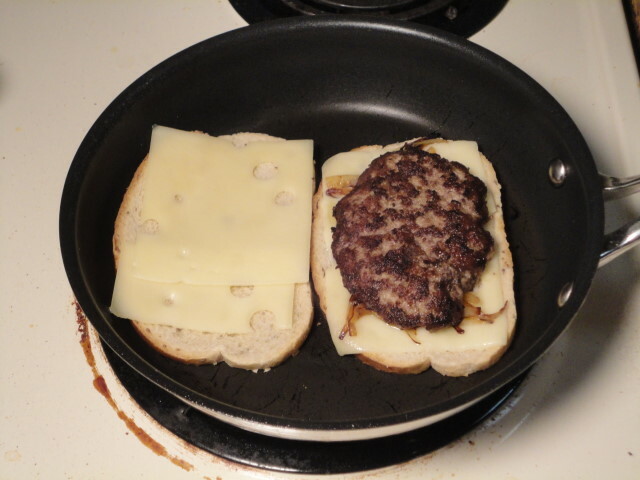 When this happens, flip the last slice over onto the burger and remove it from the pan. Repeat these steps with each burger until you’ve assembled them all. Slice them in half and serve them up!